Flotsam and Jetsam drummer Craig Nielsen -- a social media influencer with a global fan base and wide-ranging interests. It seems that lately, everybody has been talking about Klout scores, and targeting social media influencers (individuals with large networks) to build awareness for brands. Finding and persuading those with high Klout scores and identifying the influencers has become the “secret to social media success” according to many marketing writers. According to the Harvard Business Review, however, the real secrets to social media success were defined almost 50 years ago by a New York psychologist and marketer named Ernest Dichter who pioneered the science of motivation research with techniques like focus groups. One of Dichter’s claims to fame was the Exxon tiger and the slogan, “Put a tiger in your tank” to differentiate one brand of gasoline from another after his studies revealed that consumers responded well to the suggestion that a gasoline brand could provide fun, power, and freedom – no matter what kind of car they could actually afford to drive. Today, word of mouse — that is, where a positive brand experience is shared not just with a few coworkers, friends or family members, but with huge networks of online fans, followers, and connections — has supplanted word of mouth, but the principles remain the same. To me, these kinds of comments are the social media equivalent of the motivators that Dichter described. Of course, understanding the motivation for someone to speak positively about a brand, cause, or company is just the first half of the marketing process. You also need to understand what makes a listener believe what the original person is saying. Which might bring us back to Klout scores and social media influence – or maybe not. Dichter said that listeners are primarily concerned with two things. One is that the speaker be credible with experience and background that is convincing. The second is that listeners are skeptical of the speaker’s motivation. They’re looking for bias – is so-and-so trying to help me, or is he trying to sell me something? To me as a marketer, the implications of that last one – listener skepticism about the speaker’s motivation – means two things. First, when I’m at work, promoting our own brand, I have to emphasize facts instead of opinion, deliver a balanced perspective, and accurately represent my employer’s culture, values, and “brand persona”. And second, following the FTC disclosure rules about blogger and social media affiliation with a product or brand are good for anyone who wants to be taken seriously is more than consumer protection – it’s good marketing, too. 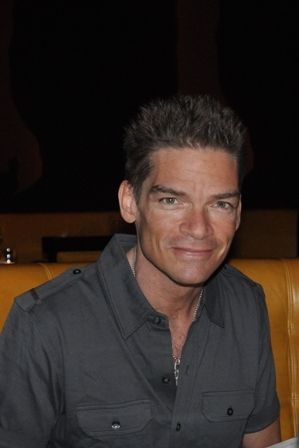 Photo Credit: Krystal McAlister took this photo of music star Craig Nielsen (Flotsam and Jetsam) at the Jean Georges Steakhouse at Aria City Center, Las Vegas, during a dinner celebrating her high school graduation in June, 2010. Gallery | This entry was posted in Uncategorized and tagged Craig Nielsen, Deb McAlister, Ernest Dichter, Facebook, Flotsam and Jetsam, Harvard Business Review, influence, Klout, Krystal McAlister, online reviews, social media marketing, Twitter, word of mouse, word of mouth. Bookmark the permalink. Deb, I love the article and the tie-in between social media and human psychology. An old law professor of mine used to always say “there is nothing new under the sun” and I have come to find that it true — “new things” are almost always reiterations of the same old principles in a new package!